Taking care of cows and family are all in the day of Debbie Lyons-Blythe, White City, who has become known throughout the world for her weekly blogs telling the real farm story. Just what can one say when talking about the nation’s best known agriculture spokesperson? The farm wife who pulls calves, bales hay, shops at the grocery store, mom of five making sure they’re where they’re supposed to be, often with them for support, still cooks breakfast, dinner and supper, plus much more. She’s the 2012 America’s Farmers Mom of the Year. Proof is in the recognition, and when she tells her story, there’s no question about authenticity: Debbie Lyons-Blythe is a cattlewoman-farm mom. Talking to city folks and rural people alike really is not a new thing, actually that’s a tad of what made her so worldwide famous, but certainly Debbie kept 210 attendees’ complete attention as she visited during the recent 580 WIBW Farm Profit Conference at Paxico. Debbie Lyons-Blythe is a farm advocate. “Oh my gosh, what’s that?” some in the group puzzled at each other. First, Debbie reiterated that she’s a rancher with 250 registered Angus cows, along with a commercial heifer development program. Amid running the ranch, she also manages five kids and a husband, Duane Blythe, and she shares her experiences through her blog www.kansascattleranch.blogspot.com. Debbie’s blogs are on Twitter, an online social networking and microblogging service that enables users to send and read “tweets,” which are text messages limited to 140 characters. Facebook is a similar online social networking service. “I graduated in journalism from K-State, but I’m a blogger. That’s quite a bit different than being a newspaper writer and editor, which I’ve been as well. A blogger tells the story as it happened and isn’t as concerned about grammar and such,” explained Debbie, who also had a stint as a county Extension agriculture agent, prior to her first baby. “Then, we made the decision if I was to take care of our family, I could also take care of the cows, and even do the farming, while my husband Duane has an off-farm job. Living on the farm that originally belonged to his great grandfather back in the late 1800s, we have our operation south of White City in Morris County, and the children have all gone to school at White City. It works well,” related Debbie, adding that like their parents, the children have been, are, or soon will be K-State students. “Why advocate?” Consumers don’t understand that meat isn’t grown in a package, corn in a can and milk comes from a cow. Having been raised on a purebred cattle operation south of Manhattan, Debbie clarified, “I didn’t really think about it until my husband’s cousin’s daughter brought her family from Denver to visit our farm and didn’t want them to eat hamburger or drink milk, because she believed those foods we thrive on would be harmful to their health. Debbie said her blog is an opportunity to share what she and her family do on the ranch every day, and connect with others interested in food production. And it works. She has had responses from people across the country. “I met a fellow from California who has taken my stories and incorporated them into presentations he gives about having a healthy diet and lifestyle,” Debbie commented. “I love that he talks about beef and believes it is a healthy part of our diet. “I’m talking to everybody, but especially the moms, just like I am, the ones who make the food purchases, and decide what their families are going to eat,” Debbie declared. While 2.2 million farms dot America’s rural landscape, less than 2 percent of the country’s population is farmers. “Most people don’t know anything about agriculture or food production period,” Debbie reiterated. Adding to the serious situation for agriculture, majority of the state and nation’s lawmakers, those who are determining legislation governing the nation, know little or nothing about food production, thus making decisions more inclined for the urban population. “We appreciate the efforts of Rep. Tom Moxley, representing the 68th district in the Kansas Legislature, but he’s a far minority, and can only do so much to influence the majority,” Debbie acknowledged Moxley, also a rancher at Council Grove, who was in attendance at the program. Concerns about factory farms, raising pigs in stalls, milking cows in tight stanchions, chickens in cages and GMOs (genetically modified organisms whose genetic material has been altered using genetic engineering technique) worry consumers, because stories reported by media are sometimes inaccurate or incomplete. “However, Kelly Lenz and the farm staff at 580 WIBW do a great job telling the truth about food production. There just aren’t enough like that,” Debbie credited. “Conversation of agriculture advocacy is changing. We need less talk about agriculture industry, and more about community, the farming community. We hear about corporations running agriculture, when in reality, 97 percent of U.S. farms are operated by families,” Debbie insisted. “Today, the conversation should be less about ‘telling your story,’ and more about answering questions. Less talking and more listening. Less defending and more educating. Less facts and more emotion,” she continued. “This is a very emotional subject. I get very emotional talking about agriculture and food production. But, consumers, mothers in the city, my relatives, they get emotional too about what they see, hear and eat. “Commercials on television to donate to humane societies and seemingly worthwhile causes plead to emotions. We must be emotional in telling our story, too,” Debbie emphasized. While the speaker is perhaps most recognized for telling the farm story with her blog, she “advocates” at community functions, school and church activities, at the butcher counter, in the grocery store check-out lines, wherever an opportunity arises. With her mother, Jan Lyons, and sister, Amy Langvardt, also both Angus breeders, along with her children and other family members, Debbie has been involved in handing out Angus beef samples in Manhattan, Kansas, and Manhattan, New York. “I was really nervous at first in the ‘big city,’ but really consumers are the same everywhere. They like to eat, but are concerned about the quality and safeness of their food supply. It is my and your job to inform them accurately,” Debbie advised. “There is no right way or wrong way to advocate. We need lots of voices. Mine is blogging, I tweet, but yours is your own. Play to your strengths, select your audience. “But again, be sure to watch your terminology, say rancher rather than beef producer. It’s a farming community rather than industry. “Use emotion, but have the facts to back it up. Then support each other,” Debbie demanded. Briefly, the speaker, dressed in jeans, boots and appropriate farmer-cattlewoman attire, explained that her children Meghan, Allie, Trenton, Tyler, Eric and her aunt Mary Ferguson nominated her for the Farm Mom recognition. Obviously, Debbie Lyons-Blythe is a prime example of what it means to be a working rancher and mom, and the reason she is so special to her family, farm, community and all involved in agriculture. 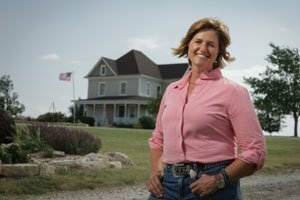 She was selected as the Southwest Region’s Farm Mom of the Year by a panel of judges from American Agri-Women and Monsanto, and later the 2012 America’s Farmer’s Mom of the Year through online voting. “There are literally thousands of farm moms who do what I do and who are so deserving of the award. I really don’t know how they select just one, but I’m honored to have been spotlighted by the America’s Farmers program,” Debbie humbly shared. “Farmers and ranchers need to tell their story; or laws, regulations and even decisions made in the kitchen will be misinformed and will limit us on what we do here,” Debbie summarized.